Doing something about the weather is no longer just talk. Excerpted from Making Sense of Weather and Climate by Mark Denny. Copyright © 2017 Columbia University Press. 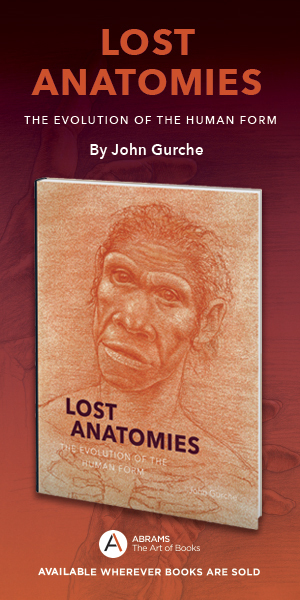 Used by arrangement with the publisher. All rights reserved. Using our knowledge of weather mechanisms, we can now manhandle the weather—physically change it to be (within limitations) more like what we want it to be. In particular, we already have some capability to make rain and are developing other possible methods of weather modification, and we may be able to reduce the global mean temperature (as well as raise it). The climate part of this capability goes by the name of geoengineering and is new; the weather part—at least the rainmaking—is older. Both are controversial, in part because they just might work. You may be tempted to think that an average global temperature increase of 4°C (7°F) is not a bad thing—after all, it is not all that much and, in temperate climes at least, it could mean no more than the difference between wearing a longsleeved shirt and a T-shirt. But, in fact, such a rise would lead to very serious consequences for global weather and climate. This temperature increase represents extra energy being put into our atmosphere by the sun. The atmosphere–ocean system being dynamic, a change in climate automatically means a change in weather. The net effect may be an average increase in temperature of 4°C, but the effect on different parts of the world will be much greater than this. Some regions may cool, while others may heat up a lot. Higher average temperature means increased water vapor in the atmosphere and more rainfall—though it will not be uniform. The global circulation patterns will get stoked up; whether they remain stable at the higher temperatures depends on the temperature rise and on the climate model—a rise of 2°C (3.6°F) may be tolerable, current models concur, but beyond that we are in the lap of the gods, with the likelihood of positive-feedback effects kicking in that can take the climate into a new state, far from the present zone of stability. The general prediction is for more extremes as average atmospheric temperature rises: wet places become wetter, with rainstorms dumping more water than they did before the rise. Dry places become drier, with droughts lasting longer. People living in subtropical regions are likely to feel the changes first, and most. There will be more extreme cyclones. Different nations will experience the effects differently, depending on geography. 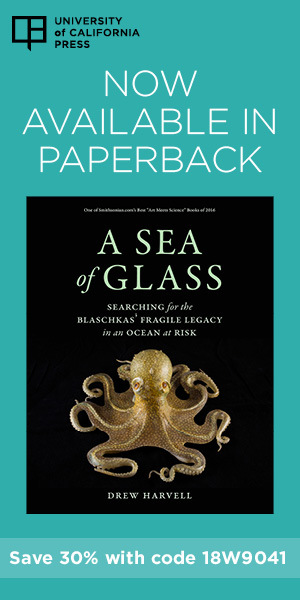 Thus, the melting of polar land ice (glaciers and ice sheets) plus thermal expansion will cause sea levels to rise, greatly affecting low-lying countries such as Bangladesh and the Seychelles, affecting countries with coastal cities somewhat less, and affecting landlocked countries such as Switzerland not at all—or, more accurately, not directly. The regional differences in climate change will doubtless lead to political difficulties between nations; some pundits foresee these difficulties escalating into wars, as migrants from drought-stricken regions pour across borders. All this from a small rise in average temperature. So, in what ways are we able to modify weather and geoengineer climate? Let us consider weather modification first. By far, the best developed and best known manmade modification is rainmaking, induced by the seeding of clouds. Rainmaking can relieve a drought and clear the atmosphere of pollutants. Chemist and meteorologist Vincent Schaefer first tried this idea in 1946, while at General Electric Research Laboratory, by flying over the Berkshires and releasing dry ice into a cloud. Snow began to fall from the cloud base, along a track following the plane. Although the snow evaporated before reaching the surface, the principle had been established. Since then, silver iodide has become a more popular seed; it has a crystal structure resembling that of ice, and so small crystals of silver iodide can act as condensation nuclei for water vapor in clouds, causing water-droplet formation and, hopefully, precipitation. The size of a condensation nucleus is much less than that of the water droplet it gives rise to, and so the mass of rain that can be produced by seeding a cloud is much greater than the mass of seeding material. 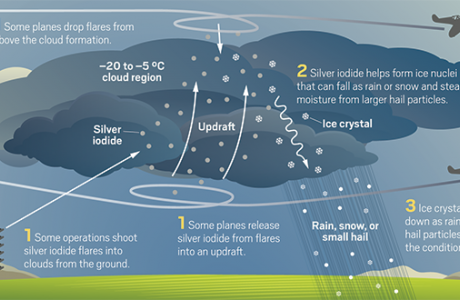 Weather modification firms launch silver iodide flares from planes or from the ground into cloud formations to try to increase rainfall or mitigate hailstorms. 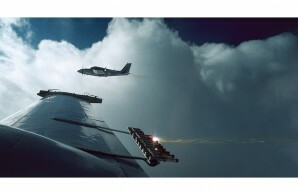 Cloud seeding has matured since Schaefer’s initial efforts. As well as using aircraft, we can seed clouds using rocket launchers and anti-aircraft guns, and may in the future use drones, which can seed a thundercloud base (which manned aircraft cannot do, for safety reasons). Results of seeding programs have nevertheless been indifferent. Critics say that the technique cannot really generate rain; all it can do is accelerate the production of precipitation that was going to happen anyway. The second strand of weather modification—still in its early stages—is storm prevention or reduction. Several ideas have been proposed to mitigate the effects of severe storms: apply laser beams to discharge lightning in storms that are building up; coat the surface of warm seas beneath developing hurricanes to prevent droplet formation (robbing the storm of energy); seed the eye wall of hurricanes (to disperse energy); deploy soot to the outer walls of hurricanes to absorb sunlight and alter convection currents; and disperse hygroscopic gel into storms (returning water to the surface). Some of these ideas are achievable for small storms, such as thunderstorms, but will be more difficult to implement on the synoptic scale. Huge amounts of soot, for example, would have to be dispersed to effect development of hurricanes. For decades regarded as, at best, a fringe science, weather modification—to relieve drought or reduce the ferocity of storms—is now at the forefront of meteorological research. China has the largest such research program, with 1,500 weather-modification professionals, plus 30 aircraft and crews, 37,000 part-time workers, 7,113 anti-aircraft guns, and 4,991 rocket launchers. If this description makes weather modification sound like a military campaign, that is not inappropriate, given the military interest that exists in researching weather-modification techniques as force multipliers. Geoengineering, if realized, would operate on a much larger scale and act over much longer timescales, making weather modification efforts seem puny by comparison. The potential climate-altering techniques that have been proposed and simulated by experts include: aircraft spraying sulfur into the stratosphere to mimic volcanic eruptions; artificial trees to remove carbon dioxide from the atmosphere; ships spraying dense plumes of particles into the atmosphere to alter oceanic clouds; sulfate aerosols injected into Arctic air to reverse sea-ice melting; and dumping iron into the seas to trap carbon and stimulate plankton blooms.